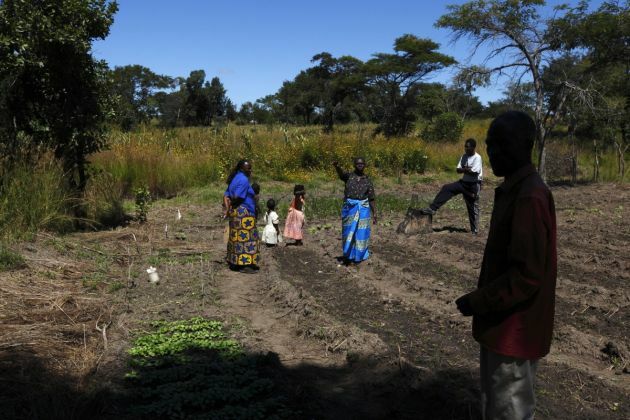 (Photo: Reuters / Darrin Zammit Lupi)HIV-positive farmer Margaret Sikabenga (C) shows a home-based care team the field she has cleared for crop-growing on her farm outside the village of Singonya, close to the town of Chikuni in the south of Zambia April 18, 2012. The caregivers on the Jesuit-run home-based care team at Chikuni run a capacity building and empowerment project at household level, offering training and assistance in crop-growing and animal rearing, as well as offering companionship, pastoral care and monitoring antiretroviral treatment compliance of HIV-AIDS patients. Picture taken April 18, 2012. Karen Sichinga knows first-hand what AIDS can do to families. The Zambian nurse lost her both her older and younger brothers to AIDS. As the newly elected chair of the Africa Christian Health Associations Platform (ACHAP) – an arm of the World Council of Churches – Sichinga works to keep other African families from enduring the same pain and losses. She strongly believes the Christians ought to have a healthcare imperative. "The global church should not neglect health and healing, which is an integral part of true Christian ministry," the World Council of Churches quoted her as saying. "The churches also have to lead the sick. To do this, it is essential that churches focus on HIV and their response to this issue." The health platform was established in 2007 to "advocate for health for all in Africa," the WCC says in a statement on its website. In this vein, the organization facilitates communication between Christian healthcare providers throughout Africa. "While we work to eliminate this pandemic and support the ones infected with HIV in our country, we must not forget the spirit with which Jesus healed the people, the non-judgmental spirit," she told the World Council of Churches. "We as Christians must emulate our Lord and Savior, Jesus Christ." In the last six years, ACHAP has played an active role in issues like the availability of medicine in Sub-Saharan Africa, the ethical implications of gender-based violence and family planning. Deeply committed to public health in Africa, in addition to her position as the chair of the African Christian health grouping, Sichinga is the executive director of the Churches Health Association of Zambia (CHAZ). Since CHAZ brings together Catholic and Protestant health carers and is the second biggest provider of health care services in the southern African nation, the group has national clout. Sichinga is also a member of the World Council of Churches' Ecumenical HIV and AIDS Initiative in Africa (EHAIA) and works closely with the Ecumenical Advocacy Alliance. World Health Organization reserach shows faith-based organizations (FBOs) provide 30 to 70 percent of health care services in many African countries. "For instance, CHAZ provides approximately 50 percent of all rural health service delivery and close to 30 percent of the national health care provision," Sichinga told the Ecumencial Advocacy Alliance. And it seems that Sichinga's efforts, along with those of others, has borne fruit. In 2012, the Joint United Nations Programme on HIV and AIDS reported that AIDS-related deaths in Sub-Saharan Africa declined by one-third between 2005 and 2011. Still, the region faces a more severe HIV and AIDS epidemic than anywhere else in the world according to UNAIDS. Almost 70 percent of all those living with AIDS live in Sub-Saharan Africa, and one in 20 adults are HIV-positive. 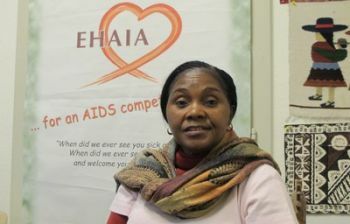 "With EHAIA initiatives, we try to keep churches informed, keeping them at the forefront of dealing with HIV and getting ready to implement new and effective strategies to address the pandemic," Sichinga said. Last October, the Global Fund to Fight AIDS, Tuberculosis and Malaria granted $102 million to Sichinga and CHAZ to support Zambia's HIV response efforts. CHAZ, founded in 1970, works with church hospitals and rural health clinics to provide both curative and preventative health services in Zambia. Sichinga told the World Council of Churches she considers CHAZ to be an example of how HIV and AIDS care in Sub-Saharan Africa should work. "At CHAZ, we provide communities holistic health services so that people can live healthy and productive lives to the glory of God," she said.